This phrase is mentioned often inside of my safety lecture at the beginning of a class. These are not just words! It should be the very core to your gun safety philosophy. It does not matter what you know or where you learned your safe gun handling habits. It does not matter where you train right now, only you are responsible for your own safety habits. This means that you need to look at what you have been taught or what you do and decide if it is really good enough. Remember, the most likely person that you are going to shoot IS YOURSELF! Is your gun handling safety habits really good enough? When it comes down to putting unexpected holes into vital areas of your own body are you really doing the best that you can to mitigate this possibility, all while still learning to be combat effective? Gun fighting is dangerous! Training to gun fight is also dangerous. The reality of the matter is that the more advanced that you get inside of your training, the more dangerous your training becomes. When we look at the reality of the fight and the likely issues that will arise inside of a fight, it is clear that we need to learn a lot more than just the optimal skill sets for the optimal situations. The reality of the reactive gunfight puts us in sub-optimal positions that require our safety habits to be the very best that they can be. We need to understand that the whole competition based safety habits simply may not be good enough inside of a fight or inside of fight focused training. We all should be at the point where we at least know the Four Basic Rules of Gun Safety. (1) Treat every gun as if it was loaded. (3) Keep your finger off of the trigger and outside of the trigger guard until you have made the conscious decision to shoot. (4) Know your target and what is in line with your target, behind and in front. But these are very general rules that do not nail down specific safety habits. The point of this article is to talk about overlooked liabilities and bad habits, more so than rules. It is the overlooked liabilities and bad habits that really define your personal safety level. The mitigation of liabilities and bad habits are what allow you to proceed into advanced levels of training, all while keeping yourself as safe as you possibly can. I will be covering the top five overlooked liabilities and bad habits that I see inside of my courses. Overlooked liabilities can be fixed inside of a two-day course, but as an advanced instructor teaching advance students advanced skill set, I should not have to constantly babysit people through their safety awareness. I should not have to constantly point out that safety issues are being over looked. These are all issues that should be taken care before the course by wrapping your head around the safety concerns involved with overlooking basic concepts. Sure I will remind you, but really, shouldn’t this be something that I should not have to remind people of. The whole “You know that you are jeopardizing shooting yourself because you are overlooking some very basic concepts” conversation gets very old, very quickly. This is by far the most commonly overlooked liability by the students. It feels as if I could spend an entire course reminding people to tuck in their loose garments around their holster. Getting a loose garment caught inside of the trigger guard while re-holstering will but an unexpected hole in you. Why would you risk such a thing over something so simple as keeping your under garment tucked in tight and your over garment clear of the holster? All of my under garments fit tight and tuck in a good 12” past my belt line to insure they do not come untucked and end up in my holster or trigger guard. When I re-holster, it is seen as an administrative process that is all geared toward a “Don’t shoot yourself stupid” mindset. My over garment is cleared completely before any re-holstering is done. I have zero concern for speed or coolness factor, such as seen on so many training DVD’s. If I need to look, I look, because it is just administrative. It is my opinion that every time you head back to ammo up, you should take a look at your garments around your holster. A couple of seconds of cheap insurance mitigates your risks substantially. If your under garment is coming untucked, tuck it in. Furthermore, take that lesson to heart, go home and find a garment that will not come untucked. It is not brain surgery or rocket science, it is basic common sense! This is something that an advanced instructor should not have to point out! Why do under garments come untucked? They come untucked because of the “elbow up” portion of the draw stroke and the pivoting during “the turret of the tank” concept. “A” shirts and Under Armor type garments work very well for me. They are tight, tuck in deep, and deal with the manipulation of the shoulders, without coming untucked. Dress around your gun and test your garments before you show up in a course. An instructor should not have to show you how to dress. When you show up for an advanced course, it is all about the skill sets and the corresponding mental aspect of the fight that are being taught. Your entire focus should be on these two things. Heck, that is what you paid for, right? This is not the place to try out untested gear! This is not the place to “try this and try that!” This is not the place to experiment! This is the place that you show up with what you know best and put it to use inside of the framework of the course. It is my opinion that you should plan on working with the one set up that you know the best, plan on working one gun, one holster, and one ammo supply method that you know the best. This is not the place to try out four different guns or four different set ups. You are there to learn what is being taught. Take that knowledge home and dry practice with all of your other gear. Inside of a course, where the learning curve is steep, concentrate on the course…..not your gear. Some of the most unsuccessful students that I have ever had were hardware focused and not software focused. While everyone else progressed rapidly…..they struggled to keep up. While struggling to keep up, their safety levels suffered. An advanced course is a challenge all in itself. Do not make a difficult and dangerous endeavor even more so, because you are hardware focused. Some will read this and think that it is contradictory to the whole “Mirrored Setup” form of training inside of FFC’s most advanced courses. That would be a huge misconception! It has been written out many times to not show up in an advanced course expecting to go dual appendix unless you are absolutely ready for this type of training. These courses are not where you learn to go dual appendix, they are designed to take your advanced skill levels to the next level. You learn to go dual appendix in your dry practice, your air-soft training, and inside of the basic courses. If you are not ready to hit the ground running, do not participate in these advanced applications. Just because some students in the course have prepared themselves appropriately, does not mean that you have. And if you have not prepared yourself appropriately, deal with that reality and learn what you can without needless putting yourself at risk by biting off more than you can chew. Having the intellect to say to yourself “I am not ready for that” is a positive trait. I will never force you to do something that you are not comfortable with. We want to challenge our advanced student base, but even more so, we want you to go home with the same number of holes that you showed up with. Watch for and get rid of any gear that might impede with your draw stroke. There should be nothing above your holster that could cause a snag on the gun or the hands. Take the safety lessons that we learned about chest rigs in conjunction with CCW holsters and apply the same concepts across the board. The last topic touched on this issue. It is very common to learn untested skill sets inside of a course. The vast majority of the time this is not a safety issue. The vast majority of time that is perfectly alright and acceptable. It is when we get to the advanced training and the increase safety concerns that these issues need to be looked at more closely. This is the point where we (the instructors) need honesty from our student base. This is the point that we need the student to be honest with themselves and with us on what they are truly and safely capable of. Everything that we learn should be run through a natural progression. This natural progression is what keeps us safe and what keeps us from biting off more than we can chew. Let’s look at one single skill set and take a look at the progression that should be involved to reach the advanced levels of the skill set. Let’s look at “Completely Ambidextrous” with the handgun skill sets. This is not something that you look at for a couple of minutes and then plan on jumping into an advanced handgun course to put into action. That would be very unwise for everyone involved. Even if you are an advanced student, there are skill sets that require you to step back to the basics, to nail down the skills that will allow you to be safe. I went through a very specific progression to be at the point that I am comfortable with my skill level, to head into completely ambidextrous shooting with a handgun. 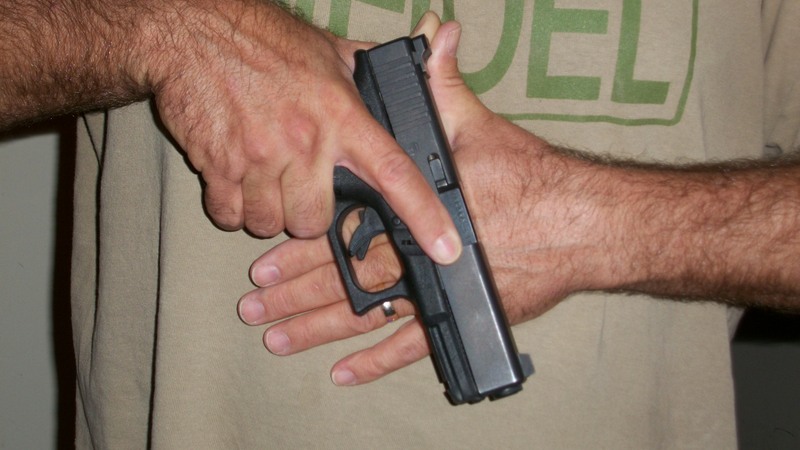 Step back to the basics and run a “secondary hand” Basic Handgun course. Run the whole two-day course with your off-hand. All manipulations, all draw strokes, and all shooting with your secondary hand. Take those skill sets and bring them home and dry practice them until you have it down cold. Have the ability to run your secondary hand at, at least 80% of your primary hand. Take a “secondary hand” intermediate level course and do the same thing, including the dry practice. Only then, after you have put in the time, step into an advanced course that runs dual appendix. We all need to recognize that it is secondary hand draw stroke and the uneducated secondary hand trigger finger that makes the dual appendix training a very high skill level skill set and high safety risk. Put in the work and never bite off more than you can chew! Inside of an advanced course is not the place to try to figure this all out! In the past, I have covered in-depth my concerns with this epidemic. I’ve trained a lot of places and proportionally my student base is the most squared away group of students I’ve ever worked with. But even some the very best have ingrained slamming their guns into their holster. Ingrained “slamming your gun into the holster” is not something that I can fix in two days. The solution to the problem is not going to come out of taking a course with an instructor. The only solution has to be made by the person that has ingrained such a reckless and dangerous habit, to reprogram not just the way that they re-holster, but to reprogram the way that they think. The slamming of the gun into the holster comes across like an exclamation point at the end of a sentence. It’s like the final emphasis put on something explosive. This process allows us to change gears from the explosiveness of our initial response, to the slow, methodical, administrative act of re-holstering the gun safely. Let me make this clear. I am reminding myself just as much as I am reminding everyone else. As an instructor, when I am giving demo’s, it is possible to think so much about the technique that I am teaching that I do not run through the after action drills as much as I should. But it is the after action drills and the mental aspect attached to them that allows for the down shifting the will dramatically cut down on the desire to slam that gun back into your holster. IMHO, there is no way to over stress the dangers of slamming your gun back into your holster. Murphy is a ruthless SOB. He will jump up and pound you mercilessly if you are not careful. I do not care if you have slammed your gun in the holster hundreds of thousand times without a problem……eventually Murphy will take his pound of flesh! This is my new pet peeve and the real catalyst for this article. I am seeing all kinds of trigger finger indexes that would be considered all well and good inside of “The Four Rules.” But once again, this is not about target shooting holes into pieces of paper…..this is about preparing for a fight! How robust your trigger finger placement needs to be during target shooting is completely different from how robust it needs to be inside of the reality of the fight. This in turn, is simply not good enough for advanced fight focused training. It is my opinion that your trigger finger should be indexed completely straight and up as high as possible/reasonable on the frame/slide. Indexed inside of the ejection port facilitates and very nice “shelf” that leads to a very robust trigger finger placement. If the trigger finger is straight, it is less likely to be effected by any sort of impact, jolt or jostle. If the trigger finger index is up as high as possible/reasonable, this leaves us a larger “margin of error” if the gun is snagged on something during the draw stroke. This snagging, which could be due to an unwise gear choice or a Murphy moment on your garments, can lead to the gun feeling as if it is going to be ripped out of the hand. At speed, the gun feeling like it is being ripped out of the hand will probably lead to a convulsive gripping/tightening of the gun hand, which can lead to a non-robust indexed trigger finger ending up inside of the trigger guard and on the trigger. Some other things to consider is an impact that you or your handgun made take while running behind or diving behind tight cover or when an adversary is trying to foul your draw, even something as simple as a grasp reflex, out of the startled response, can allow one to blow right through a non-robust trigger finger index. This is something that I lecture on at the start of every course. But it is also a habit that I will simply not be able to reprogram out of an advanced student inside of an advanced course. The proper robust trigger finger index is something that needs to be ingrained before the student ever arrives inside of an advanced course. The more advanced the training is, the more important a robust index is. When we are talking about speed of the draw stroke, speed of the movement, versatile drawing/shooting positions, and possible awkward drawing/shooting positions we need to make sure that we are mitigating our risks. One of the very best things that you can do for yourself is to ingrain a robust trigger finger placement. As it stands, I have not sent anyone packing from inside of my courses. But this one issue (robust trigger finger index) may change that very soon. If you think I am making sense here, great! Show me your robust trigger finger index inside my courses. If you strongly disagree and plan to show up to one of my courses with a non-robust trigger finger index, please do not be surprise if I send you packing. Remember, shooting yourself affects more people than just you! If your overlooked liabilities and bad habits look as if they might negatively affect your safety, the other students, myself, or Fight Focused Concepts……and you cannot get them straightened out………I will ask you to leave. I remember back in 2002 when I made the decision to work to become ambidextrous. At first, I felt “inept!” I was slow, clumsy, weak, and inconsistent. I refused to accept that feeling as my reality! Right off of the bat, I knew that I was going to have to get squared away on my own, through dry practice. The reason for this was not just about getting over my ineptitude but to get past the significant safety concerns. I had an ignorant left-handed trigger finger and an ignorant right-handed thumb. In comparison to my educated right hand trigger finger and my left hand thumb, the differences were astronomical. I did not want to show up to a live fire course feeling inept and having major safety concerns. I did not want to be “that guy!” When I did show up to the live fire course, the instructors watched me like a hawk to make sure that I was ready…..and I was. Make no mistake about it, until you have educated your secondary hand trigger finger……it is stupid……and stupidity can get you killed! You need to bring the level of “educated trigger finger” to the point that it is ingrained at a purely automatic level. This is an absolute “must have down cold” portion of your dry practice. This is not so much a “life and death issue as it is a “don’t hurt yourself” issue. The thumb of your primary hand must learn its place when it becomes the support hand during your two-handed shooting. It must learn its “thumbs forward grip” position to keep you safe from the slide coming back and smacking the stupid appendage. That thumb is used to “wrapping” around the back strap and that is what it is going to want to do unless you train it to do something else. Why Am I So Inept?! This is temporary and can be moved past very quickly with dedication. “This too will pass” is the mindset that you must have. Once you get past this period of ineptitude…..it will never come back. I went away from my “mirrored set up” for a good six years. When I came back to it, it was as if I had never left it. Right now I am at about 90% of completely ambidextrous. If I did not have significant problems with my left wrist. I would be at 98%. This was not a hard level to reach. But, it had to be reached initially, through dry practice. Dry practice until you are past being inept and unsafe. Dry practice to the point that you acquire the skill level that will facilitate not making a mistake that could be painful or deadly. Step back down to the fundamental courses and run them secondary hand only. Acquire the confidence in your well-earned ambidextrous skill sets through live fire. Step back into dry practice and practice your intermediate skill level skill sets. Begin to work past the fundamentals and start working fluid, well-rounded, and versatile skill sets. Take these skill sets into the intermediate live fire courses. Step back into dry practice and work your advanced skill sets. Take those skill sets into the advanced live fire courses. This is the progression that I took and it is the progression that I would recommend to all of my students. Do not be “that guy!” You know what I say about “that guy”…….he can get somebody dead real quick! To the vast majority of trainers and students out there, my flagship Fight Focused Handgun III – Point Shooting Concepts (FFH3) course would be seen as an advanced course. Those that train with me know that in reality, it is actually nothing more than an introductory course to the true realities of fighting with your handgun. The course is perceived as being advanced due to the fact that we do not accept that the fundamentals of marksmanship are the “end all be all” to fighting. While they are important, they are just one piece of the overall puzzle. To be as deadly as you can possibly be, while fighting for your life with a handgun, there are many more pieces that need to be added to the puzzle. I remember the very first FFH3 course that I taught and how before it was even over, the students were asking me “where do I go from here……what is next?” This is a very important question and one that needs to be answered. I could have just created another course that had a few more advanced drills in it and continued to ride the wave of success…….or I could do what I believe to be right and create a course that actually is more advanced and does prepare my student base at a higher level, inside of the matters of “life and death.” The easy route for my students and I, would be the first option. The problem with the second option is how it required me taking a good number of my students and pushing them outside of their comfort level and their belief system. From the very first, I felt that the Fight Focused Handgun V – Advanced Point Shooting Concepts (FFH5) should be heavily focused on becoming completely ambidextrous. I still vehemently feel that way today! To become completely ambidextrous, the most efficient and effective training requires mirrored set ups, consisting of a holster on each side of the body and a magazine pouch on each side of the body. We are not talking about becoming partially ambidextrous. Handing the gun over to the non-primary hand is entry-level as far as being ambidextrous. To become completely ambidextrous means, that you can and that you do, everything on the non-primary side that you do on the primary side. About 50% of my student base shows up to the FFH5 course with mirrored set ups. I would say that another 25% wished that they did and end up showing up the second day with a mirrored set up. It is the remaining 25% that this article is aimed at. The most common reason that I hear for not wanting to train with a mirrored set is “I do not carry that way, so I do not believe that I should train that way.” Guess what? I do not carry that way either! For me, this is not about training for carrying in a mirrored set up. Sure, I could do it at a very high level if I wanted to and if I was planning on just hanging out in Detroit or some other God forsaken part of the country . But I do not hang out in Detroit, so I do not carry in a mirrored setup. Training with a mirrored set up is about much more important things than carrying in that manner. It is about training to be completely ambidextrous, totally well-rounded, thoroughly fluid, and without any weaknesses or chinks in my armor. It is about training to have all of my “most likely” covered to the very best of my ability. You see, needing to be very good with your non-primary hand is not a luxury…….it is a necessity. For those that have taken force on force (FOF), how many times were you shot in your primary hand or arm? How many times have you heard about people in gun fights being shot in the primary hand or arm? This is a reality that we have to face, but it is not even the most likely reason that you need to be good with your non-primary hand. How many times have you heard of shooters who injury their primary hand or arm in completely unrelated (to guns) accidents? How many times have you heard people admit in despair, when they realize that they have not taken the time or put in the work and now they have to carry a gun without the proper skill level. On the other hand, how many times have you heard the glee in a person’s voice when they find themselves injured and find themselves prepared for that injury due to having the skills to overcome their problem. Now this is the most common of situations where you are going to wish that you had trained with a mirrored set up! Being completely ambidextrous is like knowing how to point shoot. You all have heard me say this hundreds of times…..”It is not about point shooting, it is about what point shooting allows you to do.” On the same token……..”It is not about being completely ambidextrous, it is about what being completely ambidextrous allows you to do!” Overcoming injuries is marginally interesting! The real benefits to being completely ambidextrous do not even show themselves until you are at the upper echelon of your advanced training. We have the obvious skill sets where you benefit such as shooting around cover and shooting on the move, but that is nothing compared to your abilities inside of CQB and structure clearing. In my opinion, this reason and this reason alone, is not only the number one reason to own completely ambidextrous skill sets, but the most important reason to own ambidextrous skill sets at an exponential level. If you are clearing structures using your primary hand only, you may as well tie the other one behind your back. It is my opinion that you are handicapping yourself to a level that borders on insanity. Clearing structures should flow like water. A right-handed corner needs right-handed skill sets and a left-handed corner requires left-handed skill sets. The transfers should flow without any thought and the ambidextrous retention concept should be as fluid as your movement. All of the things that you need to do to keep from being seen and shot, while fluidly keeping the handgun in the most advantageous positions as possible is not going to take place unless you have taken the time and put in the work to acquire completely ambidextrous skill sets. Training with a mirrored set up is the beginning of this path. I do not sell holsters, magazine pouches, or handguns. I am not telling you all this to sell gear. I am telling you all this because it is what I believe, what I have experiences, what I have seen, and what I know to be the very best information that I can find for my student base. If you trust me to teach you the very best information that I can find…….trust me on this! In the last two FFH5 the student base safely reached a completely ambidextrous skill level that was simply amazing. We did this in a very safe and methodical manner through dry practice and repetition. The experience from those two course and those two groups of students, has solidified my resolve to continue on this path of excellence. It had such a profound effect on me that I have now introduced a new course called Fight Focused Handgun VI – Advanced Fight Focused Drills (FFH6.) This course is going to pick up right where we left off in the FFH5 course. It is going to be heavy on completely ambidextrous while running the most advanced of the drills that have ever been seen inside of any of the Fight Focused Concepts courses.